Spiros Panacopoulos shoves all in for around 12 big blind in late position, and gets called by Frank Flowers in the big blind. The flop comes 7♣5♣2♣, giving Flowers a pair of sevens to take the lead. Unfortunately for Panacopoulos, the 6♠ turn and 5♠ river do not improve his hand, and he is eliminated from play in 8th place, shortly before the end of the night. Philip Chin was just eliminated from play in 9th place. He got it all in on the turn with the board reading A♥10♦6♦5♦ against Ernie Hou. Chin had flopped a set holding 6♣6♥, and Hou turned a flush holding 9♦7♦. Unfortunately for Chin, the 2♠ river did not pair the board, and he was eliminated from play in 9th place. Dan Chalifour shoves all in for 140,000 from under the gun. It folds to Jason Pardy on the button who reshoves for around 225,000, and Giuseppe Ruvolo calls in the big blind, having both players covered. The board runs out 9♣7♠4♣5♦5♠, eliminating Pardy in 10th place, and Chalifour triples up, with Ruvolo awarded a small side pot. Johanssy Joseph moves all in from middle position for his remaining 59,000. It folds to Philip Chin in the big blind who calls. The board runs out J♦7♥2♣4♠4♣, awarding Chin the pot, and eliminating Joseph from play. After the bubble burst, we quickly lost two players. 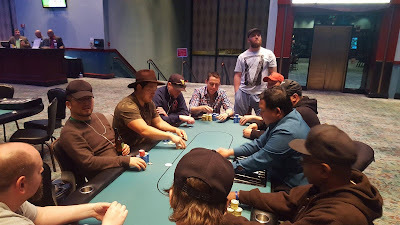 Soukha Kachittavong in 18th, and Joe Heinzmann in 17th, both taking home $3,934. 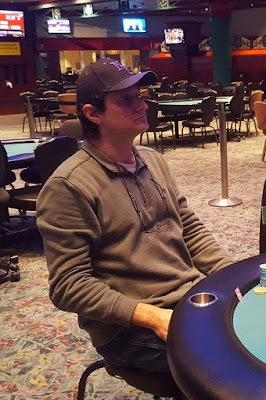 Facing a raise from LJ Sande on the button, Matthew Wantman shoves all in for his remaining nine big blinds. Sande quickly calls. The board runs out 8♥5♥4♣10♠2♦, awarding Sande the pot, and eliminating Wantman in 19th place, with 18 places paid. All remaining players are now guaranteed at least $3,934. We are down to the final 19 players, with 18 players getting paid, which means we have reached the hand for hand portion of play. 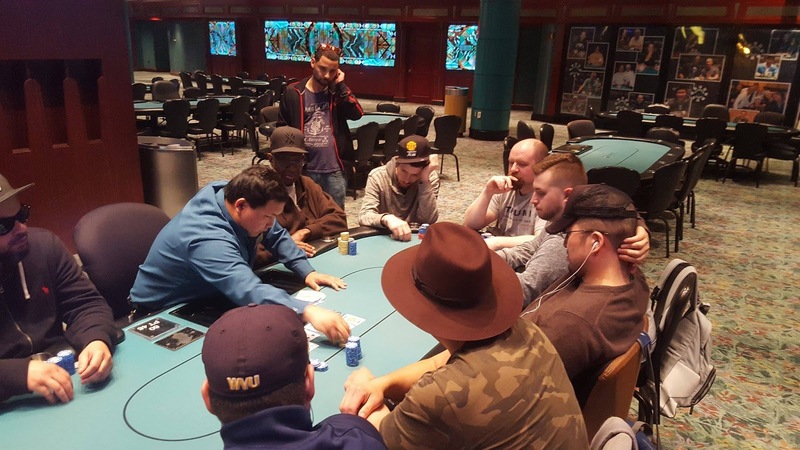 Play will continue hand for hand until we lose one player, at which point, all remaining players will be in the money and guaranteed at least $3,934. The remaining 20 players are now on a 60 minute dinner break. They will return to play Level 19 with 3,000/6,000 blinds and a 1,000 ante. The average stack upon return from the break will be 253,500. Stephen Song is still the chip leader, heading into dinner, with just under 1,000,000 in chips. Play resumes around 7:30pm Eastern time. Having just won a few big pots, and most recently, eliminating Brad St. Vincent, Stephen Song has now crossed the 1 million chip mark. He is the first player to not only cross the benchmark, but even come close to it. His closest competitor, Ernie Hou, has nearly double the average stack at the moment, but less than half of Song's impressive number. Long Tran shoves all in from early position. It folds to Ernie Hou on the button who asks for a count. Upon hearing the 66,500 total, Hou opts to fold. 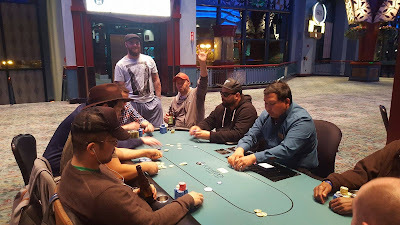 Adam Pepper quickly announces that he is all in from the small blind, and Joe Heinzmann says, "Well, I guess I fold then," from the big blind. The board runs out 9♣2♠2♦5♣8♦ awarding Pepper the pot,, and eliminating Tran from play within five from the money. Alex Chang limps in from middle position, and Ernie Hou makes it 15,000, also in middle position. It folds back to Chang who calls. The flop comes 10♣5♦2♣. Chang checks, Hou bets 25,000, and Chang calls. The turn is the J♦. Chang checks, Hou bets 40,000, and Chang calls. After a close count of chips, it's determined that Hou has Chang covered, and Chang is eliminated from play just shortly before the final three tables redraw. Nearly three minutes pass before Palma says, "I dont think I can fold this," and moves his chips forward. The K♠ turn increases Palma's lead to two pair, but the 2♥ river gives Smith a flush, and Palma is eliminated from play. 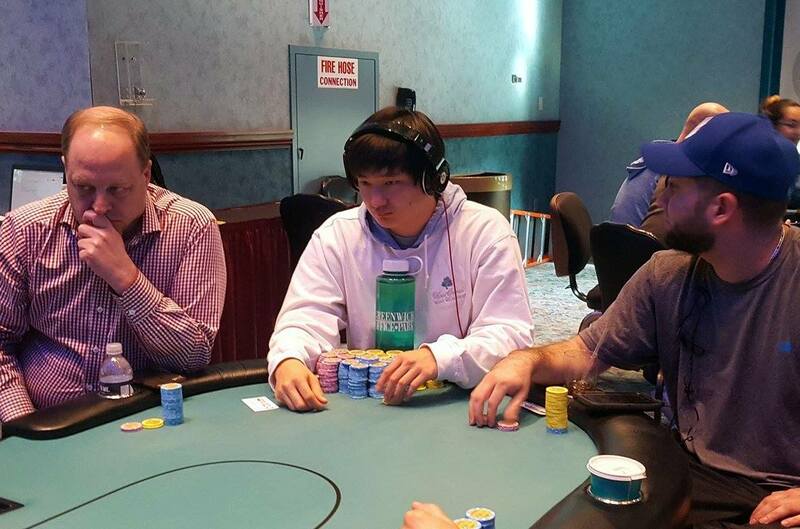 Errnie Hou is all in from early position for 55,300, and has been called by Matthew Sedgeman in the big blind. The flop comes J♣7♠5♥, increasing Hou's lead to a set. The 6♣ turn and K♣ river are safe for Hou, and he doubles up. 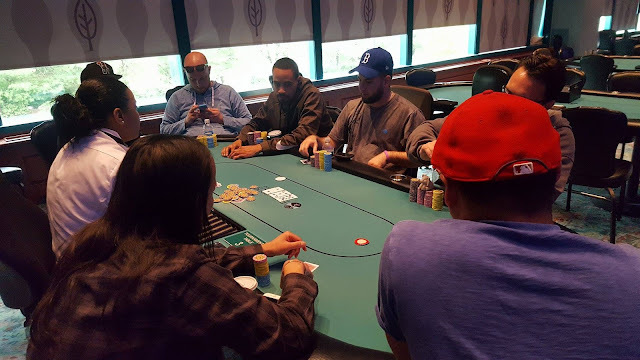 Brian LeBlanc shoves all in from the cutoff, and David Grandieri asks for a count in the small blind. Upon hearing the 50,000 total, Grandieri calls, and the big blind folds. LeBlanc will need some help holding A♠9♠ against Grandieri's A♣Q♥. The flop comes K♠8♥7♠, leaving Gradieri in the lead, but the 9♥ turn gives LeBlanc a pair of nines to take the lead. The 7♣ river is safe for LeBlanc, and he doubles up. "Maybe one of these days I wont run like complete dog s*&# here," Grandieri says as the chips are passed over to LeBlanc. Ernie Hou raises to 5,100 in early position. It folds to Johanssy Joseph in the cutoff who calls the 5,100. The button and small blind both fold, and the big blind shoves all in for 11,400. Hou calls, as does Joseph. Hou and Joseph check it down as the board runs out 10♠5♣2♠7♦J♦. Hou turns over A♥8♥, Joseph shows 4♥4♠ for a pair of fours, and the big blind says, "Can I hit just once?" as he tables A♠K♠, and then walks away from the tournament area. According to Nick Palma and Michael Clemente, Clemente was recently eliminated from play after getting his aces cracked. "This was the sickest hand of the day," Palma said, "He should be chip leader," Palma says pointing to Clemente. Apparently Jason Pardy opened to 3,500 in early middle position, another player shoved all in from later position for 23,000, and with action on Clemente, he shoved all in for his 115,000 stack on the button. It folded back to Pardy who called, having both players covered. The flop came K-K-10, and Clemente was unable to improve on the turn and river. Clemente was eliminated from play, the player in late position tripled up, and Pardy was awarded the side pot. A total of 35 players are advancing to Day 2 from the second and final flight of the $1,650 Main Event. Giuseppe Ruvolo ended the evening as the Flight B chip leader, with 278,300. 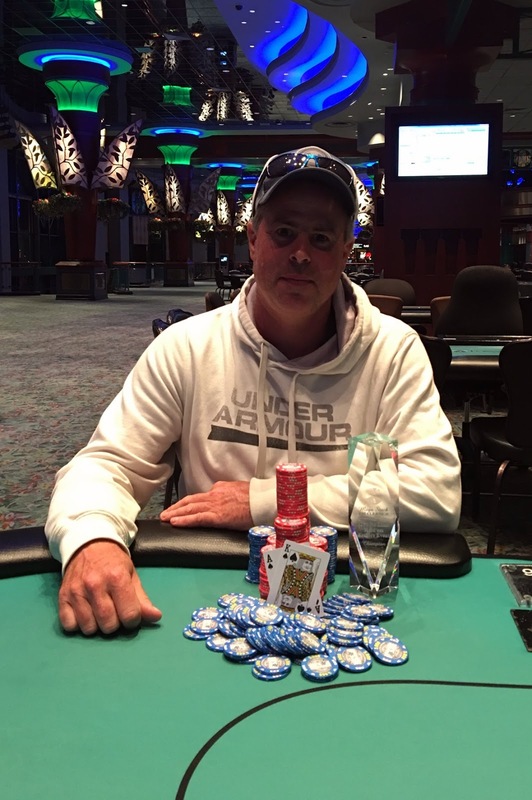 Ruvolo is also the overall chip leader heading into Day 2 play. David Grandieri, the chip leader from Flight A, will come into Day 2 second in chips. The final flight was anything but unadventurous. In the final hand of the night. Mike Nye cracked Carlo Sciannameo's pocket aces to double up, leaving Sciannameo with just over ten big blinds heading into Day 2 play tomorrow. The 35 players listed below will joint the 30 players that advanced from Flight A, and will return to play Day 2 tomorrow (Friday May 12th) at noon Eastern time. *A list of Day 2 seating assignments will be posted in the next few hours. The very last hand of the night, there were two limpers, and Mike Nye limped on the button. Carlo Sciannameo raised in the small blind, it folded back to Nye on the button who shipped all in, for around 55,000, and Sciannameo snap called. Nye was in trouble holding Q♥Q♠ against Sciannameo's A♥A♣,but the flop came queen high, giving Nye a set. Unfrutnately for Sciannameo, the turn and river did not improve his hand, and Nye doubled up the very last hand of the night, and Sciannameo was left with just over ten bigs to start tomorrow's Day 2. 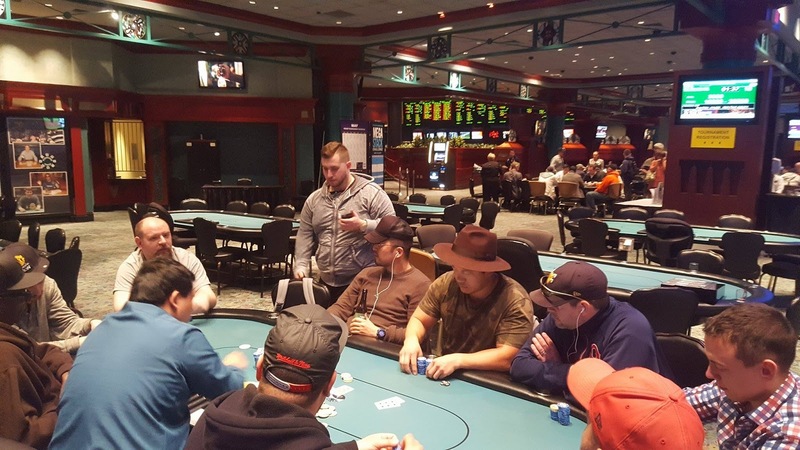 There were a total of 169 in the two starting flights of the $1,650 No-Limit Hold'em Main Event. The top 18 places will make the money, with first place taking home $63,933. The 39 remaining players are now playing their last four hands of the night. At the conclusion of those four hands, any survivors will bag up for the night, and return to play Day 2 tomorrow (Fri. May 12th) at noon Eastern time. A player in early position raises to 2,600 in early position. Solomon Yi calls the 2,600 in middle position, and Dan Chalifour re-raises to 8,700 in the cutoff. The early position raiser folds, and Yi announces that he is all in. Chalifour asks for a count and the dealer tells him that it's an additional 31,500 on top of the 8,700 bet. Chalifour pauses for a few seconds and then calls. 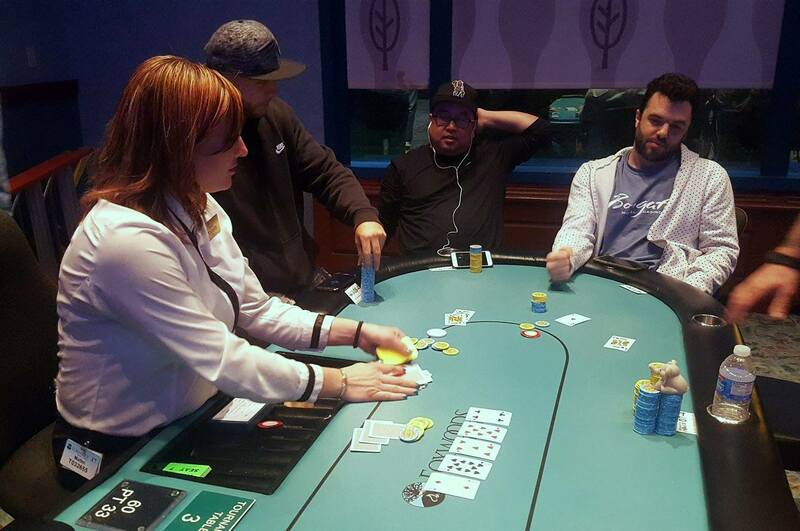 The flop comes J♥9♦8♣, giving Chalifour a gutshot straight draw, but leaving Yi in the lead with his ace high. The 3♣ turn is safe for Yi, as is the 8♠ river, and he doubles up just before the start of the last level of the night. Players are nearing the end of level ten, and heading into the second to last level of play. 30k 3rd brk Inda @FoxwoodsPoker Main.